>> Note: If you live in a “high-priced” state like AZ, CA, IL, NJ, PA, FL, TX or WA, OREP does not limit coverage or raise your rates. The same rates apply in all states where this program is offered. 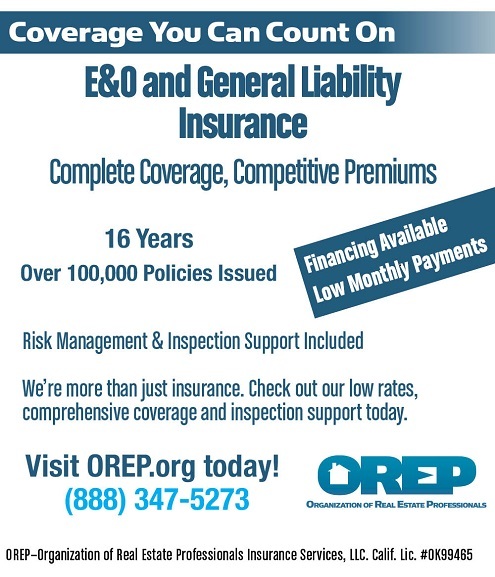 Check out OREP today. Editor’s Note: It is said that clothes make the man (or woman) but how much do they matter to the success of a business? Opinions vary but as you will see, according to many seasoned inspectors, everything matters. Looking out for a buyer’s interests and ensuring they are satisfied is vital for a home inspector to gain repeat and referral business. But while a home inspector may believe that the quality of their inspection report should speak for itself, the client and others present at the inspection may be forming an impression of the inspector based on far more; how he or she speaks, acts and dresses. Since every inspection represents an opportunity to market not only to the buyer but to the buyer’s agent, seller, and the seller’s agent, being perceived as a competent and skilled professional is a must if the inspector wants to maximize referral business. Consequently, how inspectors dress is an important and often overlooked factor in how they are perceived. Dress too nicely and the client will suspect you aren’t going to do a thorough job. Dress too poorly and the client (and others) will consider you unprofessional or worse. Inspector John Smith says that a few of his recent buyer-clients have mentioned that their previous inspector showed up in shorts and a tank-top. “My clients were definitely not impressed with their previous home inspectors, or their inspections, but I can’t help but wonder if the clothes set the tone. As for me, I always wear a pair of khakis and a button down shirt with a logo,” says Smith. Dana Bostick, an inspector for over 10 years in Los Angeles, says that deciding what to wear to the inspection can be difficult because an inspector must strike the right balance to avoid leaving clients with the wrong impression. “For some, if not most clients and agents, perception is reality. If you show up dressed in business casual attire looking like you don’t intend to get dirty, your credibility may suffer,” says Bostick. However, the opposite approach is also damaging to the inspector’s credibility, warns Bostik. “On the other hand, if you show up in a beater truck, wearing trashy clothes, and looking like you just stopped by on the way back from the dump, this too can reflect badly on you. You should have a clean truck in good repair and not leaking oil all over the driveway. Proper, reasonably clean work attire conveys a professional image and credibility,” says Bostick. Michael Bronner, an inspector in Georgia for nearly 20 years, says that inspectors are professionals who should dress accordingly. “I always wear nice slacks and a polo type shirt- tucked in, belt, nice, decent condition shoes. My truck is always clean and looking good (and it is 11 years old). If I look like this, I don’t feel ashamed and can confidently ask for and get paid the amount that I do. You can wear whatever you want to an inspection, but I feel that as professionals we should dress the part, if we ever want to earn widespread respect in the marketplace,” says Bronner. According to Bronner, dressing professionally isn’t an excuse or barrier to doing a thorough inspection. “I crawl on my hands and knees, too. I go into crawl spaces (wearing protective gear and coveralls). I belly crawl under decks and come out of attics covered with insulation too. But I do all this while still looking the part, with my slacks and Polo and I feel good about how I look,” Bronner says. As far as keeping tidy over the course of a full day inspecting, many inspectors recommend carrying an extra pair of clothes and shoes to clean up between inspections. “I’ve learned to carry two-three extra pairs of shirts and pants in my truck in case I need to change,” says inspector Rick Hurst, from Texas. Ramsey says he wears the same professional clothing regardless of whether the client is attending or not, crawlspace or not. “Every inspection is a marketing opportunity. I also have real estate signs with my company logo and contact information that I post in the yard during the inspection. That way neighbors and traffic know why someone is walking around on the roof or peaking in windows. Some clients allow me to leave the sign for a week or two,” says Ramsey. Some inspectors argue that the perception formed by the client is, or should be, based on how they perform the inspection instead of what they wear. Inspector Robert Frank from Michigan says he doesn’t have a particular dress code, but tries to make sure he has a clean appearance on arrival. “I don’t know if it makes a great initial impression, but at the end of the inspection, my client’s impression is that I spent four to five hours at the house, crawling through the insulation in the attic to the back corners, squeezing around in the crawlspace and clearing out the cobwebs in the corners of the basement. It is about the client being impressed and appreciative at the END of the inspection,” says Frank. Gordy Zorn, a home inspector in Nevada, whose background is in residential construction, says he simply wears blue InterNACHI t-shirts and a pair of jeans to his inspections. “The t-shirt and jeans always look new. Nothing faded. The only thing that’s a little dirty is my tool pouch but I’m not about to buy a new one for every inspection! I just can’t see wearing nice clothes to an inspection when I know I’m going to get filthy. The only ones who judge me are some of the agents. I guess they’re used to seeing the dressed up inspector. I’m there to inspect, not look pretty,” says Zorn. Zorn says that he has to laugh when he hears other inspectors say that if he doesn’t wear nice clothes, that he isn’t a professional. 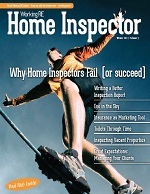 “Home inspectors are no different than plumbers, electricians or any other tradesman who comes knocking at your door. When was the last time a plumber knocked on your door looking like he’s ready to play a round of golf? I’m there to do a job for my client and get into crawl spaces and attic areas where others don’t go, not win a beauty contest,” says Zorn. 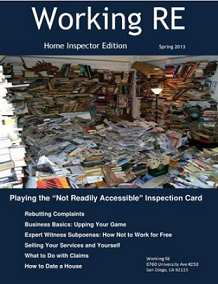 The impression that a client or potential client has of the home inspector plays a critical role in whether the inspector will receive repeat or referral work. Whether home inspectors like it or not, their attire is an important part of that equation. Whatever a home inspector wears to the inspection, it’s recommended that it be clean, at least in the beginning. The challenge is maintaining a professional appearance while ensuring that the client is confident in the inspector’s ability to perform a thorough and quality inspection, but it pays off for those who can do it well.